On October 9, 2011, Occupy protests were taking place in over 95 cities across the world. In mid-October, the movement found its way to Durham, North Carolina, a city that in recent years had had to battle against social economic disparity and gentrification. 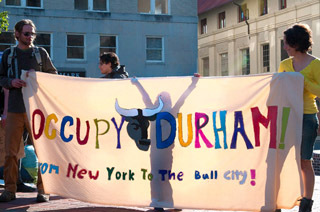 Occupy Durham has devoted the last three months to fighting for financial freedom through a series of initiatives, one being the Move Your Money campaign. On November 22, I had the pleasure of chatting with Aurelia D'Antonio, organizer of the Durham Move Your Money Campaign at Francesca's, a locally owned coffee shop. 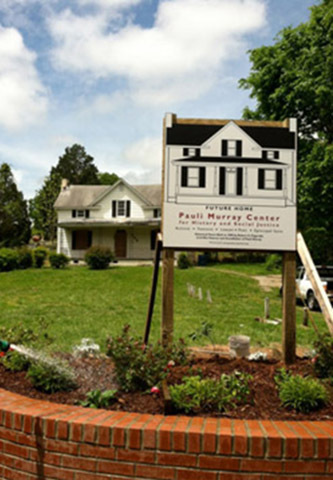 Pauli Murray, influential 20th Century human rights activist, grew up in Durham's West End neighborhood. Murray was a lawyer, feminist, poet and Episcopal priest.Her childhood home was named a National Treasure in 2015 by the National Trust for Historic Preservation. 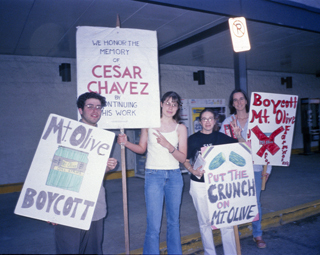 A year long boycott of Mount Olive Pickles by the Farm Labor Organizing Committee began in 1999. One local leader, Joan Priess, led this effort at a local Kroger Grocery. Donning a pickle tiara she founded the Triangle Friends of United Farm Workers and mentored many young activists. Student protesters outraged by the killing of black college students at South Carolina State University in Orangeburg amassed at five points to express their anger. A coffin was set on fire prompting local fire and police official to try to intervene. 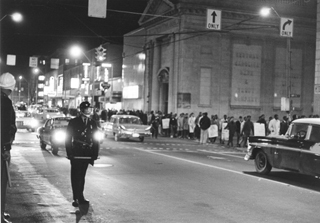 Durham had not experienced this kind of violent protest making this a particularly significant event in Durham's civil rights history. Lawyer and civil rights activists Floyd McKissick proclaimed, “Tenants cannot be evicted without due process,” when he heard that community organizer Joyce Thorpe had been thrown out of her public housing unit for working to empower low-income black women. As a citizen, she is entitled to fair treatment in the judicial system, and public housing agencies must provide explicit reasons for evicting tenants. 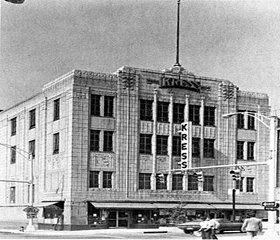 “Did the roof fall in today?” Mayor Mutt Evans asked the manager at Woolworth’s five and dime in the downtown Durham in July 1960. The business had just served a Coke to its first black customer. 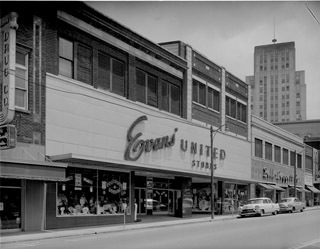 It was the start of a new era for the Bull City and as Durham’s first Jewish mayor, Mutt Evans was uniquely equipped to navigate the period’s racial tension and lead Durham towards a brighter future. 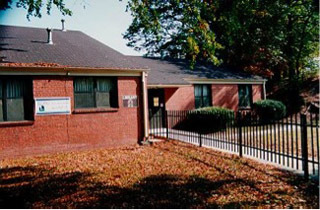 Lunch counter sit ins by young people in Durham were inspired by the moving speech given by Dr. Martin Luther King Jr. at Durham's White Rock Baptist Church in 1961. A Ku Klux Klan leader and a civil rights activist becoming best friends? Who would have thought? Certainly not CP Ellis and Ann Atwater, but this is exactly what happened after a meeting was organized to discuss the status of Durham public schools. 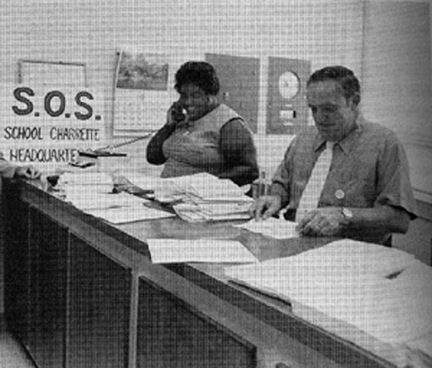 CP Ellis was the president of the KKK in Durham and Ann Atwater was a black civil rights leader. They were complete opposites in ideology, race, and ideas about racial rights and power. The only two things they had in common were their low economic status and their power in their respective communities. 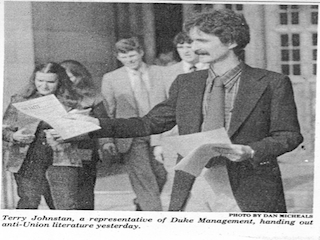 Duke University Hospital workers fought for the opportunity for collective power in the face of an institutionally discriminatory Duke Hospital Administration… With worker’s rights movements buzzing around Duke’s campus starting in the late 1960s, the Duke Medical Center was on the verge of drastic changes. In 1974, Duke Medical Center workers had finally reached their tipping point. A silent vigil by 125 Durhamites of all races, faiths, and sexual orientations met 63 members of the KKK when they marched through downtown Durham on June 14, 1987. Wearing checkered arm bands, the coalition powerfully announced their disapproval of this blatant display of hatred. On Sunday, June 14th, 1987, sixty-three members of the Ku Klux Klan marched through downtown Durham chanting “K-K-K! 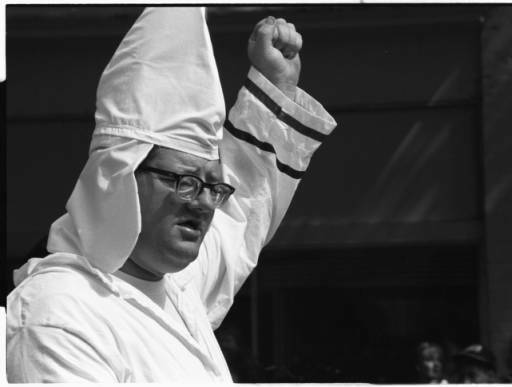 K-K-K!,” Across the state, Klansmen branches in Raleigh, Charlotte, and Greensboro were also rallying to grow their ranks by recruiting new members.